Since we were acquired by Konica Minolta in September 2016, the DocPoint Solutions (DocPoint) and Quality Associates, Inc. (QAI) teams have become a true component of the enterprise content management (ECM) practice of Konica Minolta’s business intelligence service (BIS) division. We continue our mission of supporting mid-size to large businesses, as well as federal agencies, while leveraging the vast resources of Konica Minolta to help support and expand our business process outsourcing (BPO) and content services (CS). 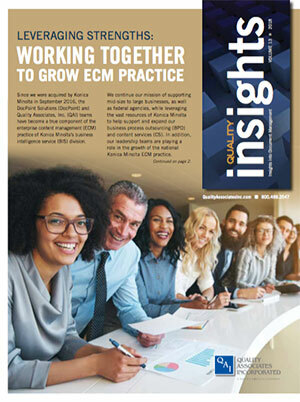 In addition, our leadership teams are playing a role in the growth of the national Konica Minolta ECM practice. As Konica Minolta looked to transform itself from a purely hardware provider to a solutions provider, the ECM practice was developed. Initially the practice was a regionalized offering. In the past year the sales and operations teams from across the ECM practice have worked together as one team to implement scalable, repeatable business processes. Those processes, in combination with showcasing the expertise of the employees throughout the practice, has allowed us to grow as a national organization. Over the past year, team members from across the Konica Minolta ECM BIS practice have worked together to learn all the services and solutions available to current and prospective clients. This has changed the way the practice as a whole approaches document scanning and conversion projects. Instead of looking at a project as an isolated event—digitizing documents—we are all asking questions to determine the business drivers of digitization. From here we can not only determine the best process for scanning and converting documents, but can provide a complete paper-to-cloud ECM solution that supports current and future business needs all under the Konica Minolta umbrella. Like any business, as the national ECM practice grows, the scalability of our solutions and services is critical for our success. Our team continues to optimize our processes across all divisions in order to continue to deliver solutions that are based on our clients current and future business needs—no matter how small or large the operation.